Mount Eddy is the highest peak of the Trinity Mountains, a mountain range of the Klamath Mountains System, located in Siskiyou County, and Trinity County in northern California. The mountain is in the Mount Eddy RNA, a Research Natural Area on the Shasta-Trinity National Forest, a unit of the United States Forest Service. The summit rises to an elevation of 9,037 feet (2,754 m), and is the highest point in Trinity County, the ninth most prominent peak in California, and the highest summit west of Interstate 5 in the United States. The peak is west of Mount Shasta City and the massive Mount Shasta volcano. It is protected within the Shasta-Trinity National Forest. The mountain receives heavy snowfall during the winter due to its altitude. The mountain is named in honor of Olive Paddock Eddy, who is mistakenly held to be the first woman to climb Mt. Shasta. She was actually 8 months pregnant at the time that she is credited with climbing the volcano. Harriet Catherine Eddy was actually the first woman to summit the mountain. Nelson Harvey Eddy arrived in the area from New York State in 1856. He later became a successful rancher in the Shasta Valley. The original, Wintu, name might have been Num-mel-be-le-sas-pam or "west blaze mountain". 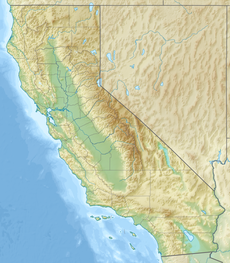 ^ "California County High Points". Peakbagger.com. Retrieved 2016-08-10. ^ a b "Eddy". NGS data sheet. U.S. National Geodetic Survey. Retrieved 2014-01-13. ^ a b "Mount Eddy, California". Peakbagger.com. Retrieved 2009-09-09. ^ "Mount Eddy Topo Map, Siskiyou and Trinity Counties CA". Topozone.com. ^ "Pacific Southwest Research Station, Research Natural Areas". Retrieved 2016-08-10. ^ "Subsection M261Aj – Upper Scott Mountains". U.S. Forest Service. Archived from the original on 2007-08-13. Retrieved 2014-01-19. ^ Gudde, Erwin G. (1949). California Place Names. Berkeley: Univ. of California Press. p. 103. Wikimedia Commons has media related to Mount Eddy. "Mount Eddy". Geographic Names Information System. United States Geological Survey. This Trinity County, California–related article is a stub. You can help Wikipedia by expanding it.